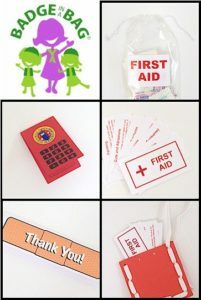 A leader asked about kid friendly first aid kits on our Facebook page. Leader question: What have other leaders put in a Kid Friendly First Aid Kit? Sort of feel like gauze pads, tape etc., might be not appropriate but what are others thoughts? This first aid kit would not be for our troop, but for the girls to make for their own homes as part of earning the Brownie First Aid Badge. Anyone have suggestions on what to put in one a child would make and possibly have access to? Melissa shared the difference between the troop first aid kits and what is in the girls personal first aid kits: We have three first aid kits… The big one for camping. You name it, I probably have it in there… The small one we use during troop meetings and outings. 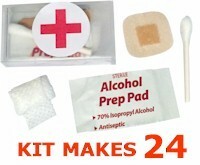 It has band aids, antiseptic wipes, gauze pads, tape, scissors, safety pins, hygiene products(for bigger cuts. I have brownies), a mini sewing kit, pen, paper, bug spray, tweezers, lotion, gloves, girls info, council info and 2 plastic ziplock bags. One gallon size, one sandwich size. The sandwich size one has a gel pack in it for bumps/bruises. The mini one(s), each girl has one… We take those for personal use. They are washed out pill bottles. It has 3-4 band aids, a couple antiseptic wipes and 1-2 antibiotic cream samples in there. You never know what you may need, but I’d rather be covered on all bases. Viki shared: We made ours using large prescription bottles donated by CVS. Be sure to ask for the pop off cap. 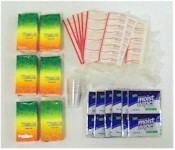 Then we put in several sizes of band aids, anti bacterial wipes, a guaze wipe, a whistle. We were also going to make individual use anti bacterial ointment packets using straws but it was a mess. Really pretty much anything she could use for scrapes/bumps/bruises and to signal for help but no meds of course. For additional age appropriate ideas for earning the Brownie First Aid badge, scroll down to Brownie First Aid Badge section of the page ‘Ideas for Earning Brownie Badges and Awards‘. I would love ideas for our brownies troop here in Lima! Assuming that Brownie girls in Lima are the same age as Brownie girls in the United States, the ideas here should be adaptable.